This snowmobile safari takes place in the Lovozero Region, which is the area of pristine nature, uninhabited tundra, reindeer, and unique atmosphere. This is the land of the Sami people, who are one of the indigenous peoples of Europe. Most Sami people in Russia live on the territory of the Lovozero Region. Their main occupation was reindeer herding and till today it is still quite popular. This 3-day tour will acquaint you with outstanding nature of the area as well with the Sami traditions of reindeer herding and with national cuisine. 09:00 Meeting with the guide in Murmansk. Transfer to the Lovozero. Upon arrival Getting equipped. Safety measures. Training course. After you got equipped and tried your snowmobile, it is time to start the adventure! At first we cross the Lovozero Tundra to reach the tourist complex. Upon arrival accommodation and lunch in the traditional Sami hut covered with reindeer skins. Afterwards we head for the reindeer farm to get acquainted with the Sami traditions of reindeer breeding. After a selfie with reindeer and reindeer feeding we return to the tourist complex. Free time to admire pristine nature of the Kola Peninsula. In the evening sauna will help to relax after a long ride, and during dinner you will share your first impressions with the group. In the evening if the sky is clear there are high chances that you see the magical Aurora Borealis. Breakfast. 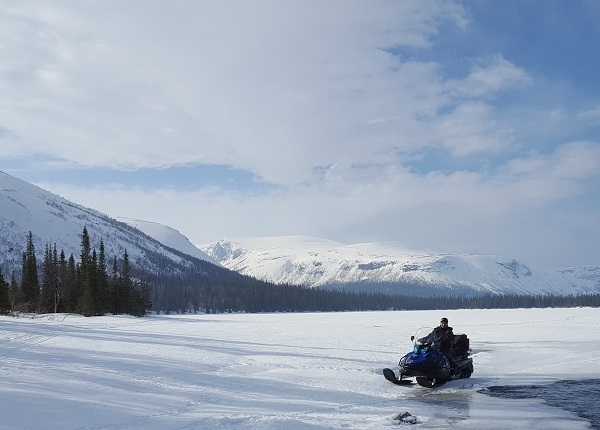 Departure by snowmobiles to the Sedyavvr Nature Reserve to enjoy breathtaking views of the area and to the visit the sacred lake for the Sami people, which is called the Seydozero Lake. This lake is famous for being a spiritual centre of the Sami people. It is situated in the area of rare beauty among the mountains of the Lovozero Tundra. On one of the mountain slopes you will see an image of a human, created by nature forces, which the Sami people consider to be the spirit of this area. Free time to take pictures and enjoy packed lunch near the campfire. Dinner upon arrival at the tourist complex. Sauna to relax after today's snowmobile ride. Breakfast. Today we go by snowmobiles to the mountains to enjoy the panorama of the Lovozero Tundra from the top of the 1000 m mountain. Free time on the top of the mountain. Lunch will be replaced with picnic on the top of the mountain. Dinner upon arrival at the tourist complex dinner and departure for Lovozero. Transfer to Murmansk. The tourist complex is situated in the Lovozero Tundra far from civilization. The houses are made of wood according to the traditions of the Sami people. Attention! The room facilities do not include WC or shower! The heated WC is situated outside.